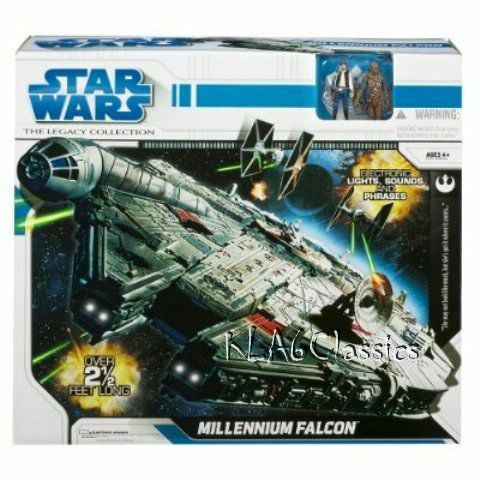 Another item that’s on the “Things still to get” pile is Hasbro’s Big Millennium Falcon or BMF for their 3 3/4 inch action figure line. For me, this is possibly the most important version of the Millennium Falcon since the Studio Scale model from Master Replicas. At two and a half feet long, it’s certainly a bit of a beast. It is supposedly nearer to a full scale for the action figures. I have seen some people commenting that it’s not really to scale, but generally, this has been very well received among the Star Wars collecting fraternity. I think that it’s also imporatant to stress that it’s a toy. A big toy and and expensive toy at £150, but it’s still a toy and for a toy, it does look pretty damn good. There’s a lot of detail and there’s a hell of a lot of thought that’s gone into this. 24/01/11: I just received my shipping notification from Forbidden Planet.com. It looks like this has shipped. Great News!!! 18/02/11: I took delivery of this today, so that’s a big tick for my collection as this is very hard to find at the moment. First impressions are good. There’s a lot of love gone into designing this. This entry was posted in Hasbro, Toys and Games. Bookmark the permalink. I also want one of these. I wanted one when they came out, but I kept waiting to get a good deal (some people reported getting them on clearance for as low as $30) but I never found a cheap one, and now they’re gone. I’m sure it’ll be re-released sooner or later, though.